It's appalling how much of America's film history has been lost to the ravages of time, especially from the silent era. Then in the eighties, media mogul Ted Turner wound up owning a huge library of older films, and decided that it would be a good idea to add color to the black and white ones. It was at this point that a movement began to preserve classic films and prevent them from being tampered with. 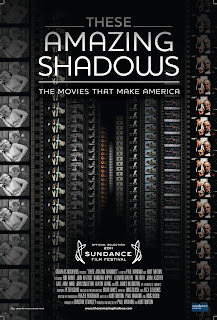 The movement resulted in the National Film Registry, which each year picks up to 25 films that it considers of cultural and/or artistic merit, helping to insure that they will be preserved for future generations. 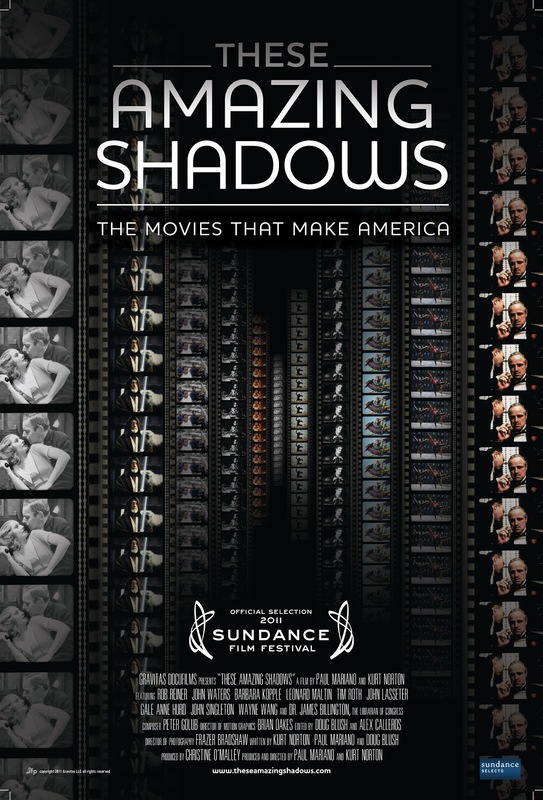 THESE AMAZING SHADOWS documents the birth of the National Film Registry and its work to date, mainly through interviews with filmmakers and other celebrities who talk about favorite films that have been added to the list. Many of the titles discussed here are expected (THE WIZARD OF OZ, THE GODFATHER), but not every film chosen is a Hollywood classic. In fact, some of the most interesting films we see discussed here are strange little artifacts like the “Let's all go to the lobby” advertisement that ran between features back in the days when movie theaters routinely showed double features, or the odd blend of advertisement and propaganda in which keeping your house painted is shown to make it safe from nuclear attack. On a more serious note, there's also the home movies taken by a resident of a Japanese internment camp which help document one of the more shameful chapters in American history. I had already written a somewhat lukewarm review of this film as I saw it on the screener DVD sent to me. Then I noticed there was a longer version available on Netflix Instant (also on DVD and Blu Ray I would imagine). One of my major problems with the version on the screener, which ran a scant 53 minutes, was that it really didn't give much information on how films were chosen to be added to the registry, nor did it mention just how much of film history has been lost, or talk much about the restoration process. Instead, it was exactly the kind of fun but lightweight clip show Leonard Maltin speaks of dismissively in his interview (included in both cuts). The full length version is about 40 minutes longer and remedies all of these issues. Unfortunately, it will be the short version that airs on PBS. It's kind of ironic when you think about it that a documentary on the subject of preserving and restoring films is itself being presented in a compromised version on TV. The TV version is still enjoyable, but it's lacking most of the substance that makes the longer cut so compelling. 2 1/2 out of 4 stars for the TV version, 3 1/2 out of 4 for the longer cut.